My theology professor Dr. Horner used to incessantly remind us that ideas have consequences. What we believe determines how we behave, and ultimately who we become. I was recently reminded of his dictum while reading an article in Time by David Van Biema entitled, "Should We Blame God for the Subprime Mess?" Van Biema notes the research of Jonathan Walton, a religion professor at the University of California Riverside. While researching a book on black televangelism...he realized that Prosperity's central promise — that God will "make a way" for poor people to enjoy the better things in life — had developed an additional, dangerous expression during the subprime-lending boom. Walton says that this encouraged congregants who got dicey mortgages to believe "God caused the bank to ignore my credit score and blessed me with my first house." The results, he says, "were disastrous, because they pretty much turned parishioners into prey for greedy brokers." 32 But recall the former days when, after you were enlightened, you endured a hard struggle with sufferings, 33 sometimes being publicly exposed to reproach and affliction, and sometimes being partners with those so treated. 34 For you had compassion on those in prison, and you joyfully accepted the plundering of your property, since you knew that you yourselves had a better possession and an abiding one. 35 Therefore do not throw away your confidence, which has a great reward. 36 For you have need of endurance, so that when you have done the will of God you may receive what is promised. 37 For, "Yet a little while, and the coming one will come and will not delay; 38 but my righteous one shall live by faith, and if he shrinks back, my soul has no pleasure in him." 39 But we are not of those who shrink back and are destroyed, but of those who have faith and preserve their souls. 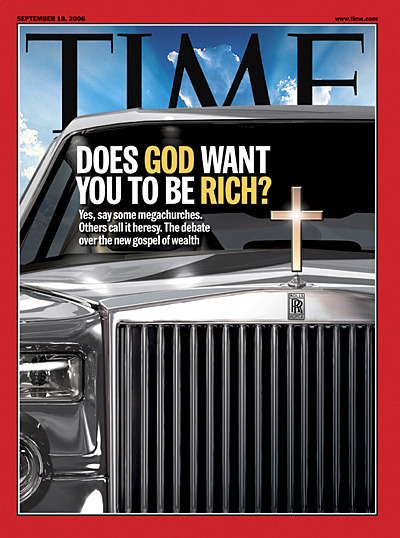 My suspicion is that there is a very, very nice place in hell for the prosperity gospel. ...a very, very nice place in hell with a broken down Cadillac and millions of dollars in Confederate money. Great post, thanks. I agree, sad but all to true. Great analysis. This is why, when talking to people about this economic situation we're in right now, I've been saying that there is definitely a place for criticizing the role of the government and Wall Street in this whole mess, but this is first and foremost a moral and ethical issue. The solutions are not found in how we deal with government and economics. The solution begins with what's in our hearts.